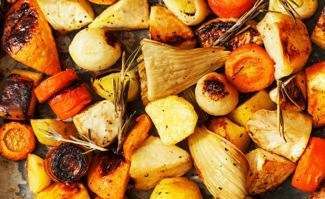 The cozy taste of Thanksgiving can be enjoyed any day with this delightful roasted vegetable with rosemary recipe. It is kind of one I made up along the way from many different inspirations and is highly adaptable to what to have on hand. It’s especially nice in the fall and winter when root vegetables such as sweet potatoes, turnips, parsnips and the like are easy to find at the local farmer’s market or grocery store. As I often tell my friends who have asked for this recipe, “if you like the vegetable, it can likely go into this dish”. The more variety the better for the most health and nutrient-filled meal. FYI – This recipe is Vegetarian, Vegan and Gluten-Free. Dump it all out flat onto a cookie sheet and put it in the pre-heated oven for 40 minutes. Stir every 15 minutes or so for thorough roasting but be careful in that hot oven!